My last week of travel ends with a week at my oldest son's house in MD. I spent a week in February with my youngest son and family in CA. Stopping and visiting my son's and their family is not a requirement, but a joy to spend quality time with my family. Especially, with each set of granddaughters, two on each coast. Yes I'm a proud grandfather of 4 granddaughters. As I prepare to end my 2017 Travels and leave for home, here is a look at my two east coast wild woman. This was a game where you put whipped cream on a mechanical hand and your face in a hole. You spin a handle the number of times that the spinner landed on. Click, Click and you wait to see if you get whipped cream in your face. 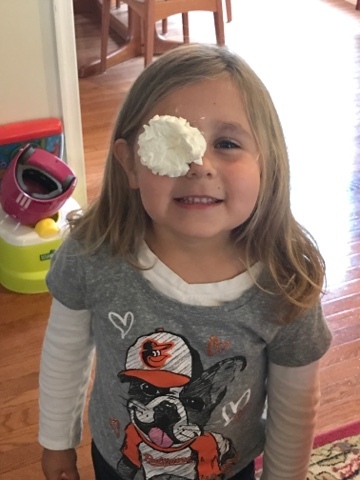 Above is the 5.5 year old granddaughter proudly wearing her whipped cream face. Possibly I should say eyepatch. 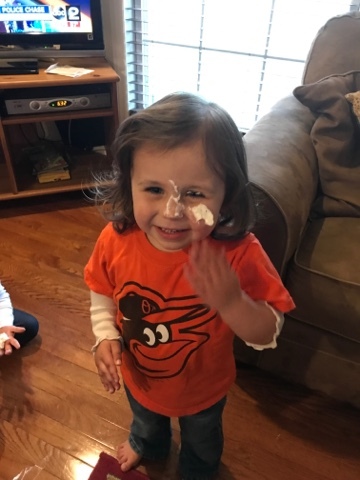 Above the 2.5 year old looses her whipped cream, sliding off her face and landing on the floor. Yes, not my best look, but I'm all in to the game. 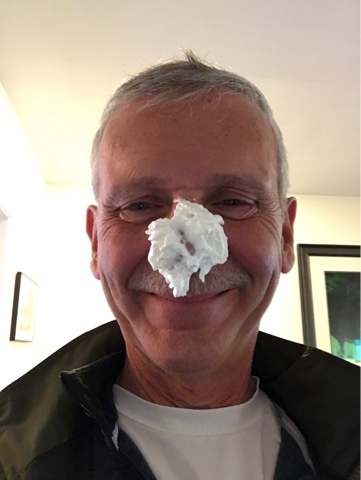 Of course the girls go wild when the adult gets a dollop of whipped cream on his nose. 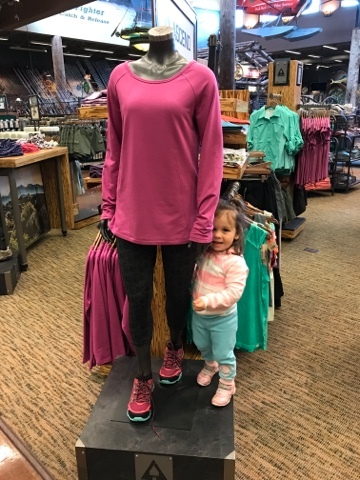 We had some other good times taking the youngest to the mall, where she was hiding or looking to go home with a dummy. 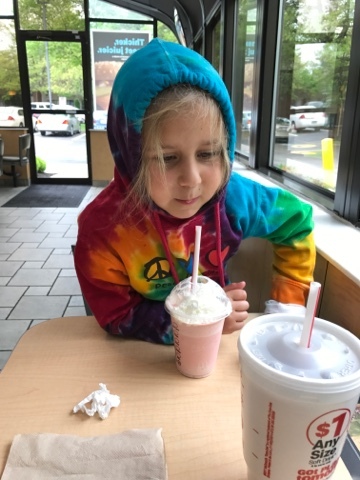 My unsweetened iced tea was sweetened by spending time with the oldest. 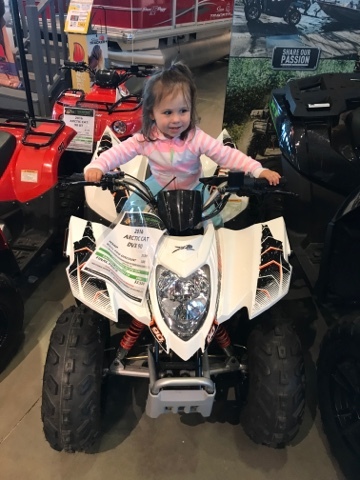 Don't take this woman to Bass Pro as you need to plan 45 minutes and pry her off all the adult toys to move on. I've had mostly cool weather here with rain. 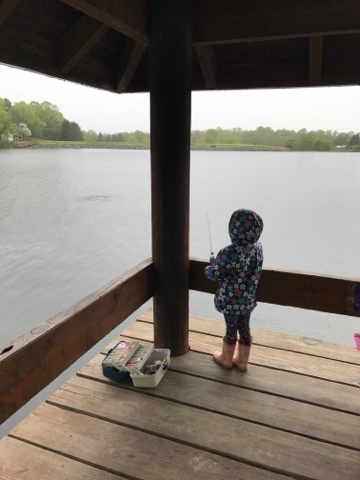 Here the oldest is trying to catch the big one in the rain. I'm so glad this dockside gazebo provided coverage to allow us to stay fishing. Of course granddad got to put the worms on the hook. The fish stayed elusive taking the bate off the hook disputed our efforts to trick them. Ah the life of a grandfather. Love these pictures! It was a great visit.